Tiny, inexpensive robots are a great way to experiment with robot swarms. 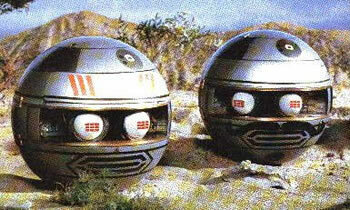 Take a look at this video with twenty of the robots, nicknamed 'droplets'. When the droplets swarm together, University of Colorado Boulder Assistant Professor Nikolaus Correll said, they form a 'liquid that thinks.' Correll says there is virtually no limit to what might be created through distributed intelligence systems. 'Every living organism is made from a swarm of collaborating cells,' he said. 'Perhaps some day, our swarms will colonize space where they will assemble habitats and lush gardens for future space explorers.' Swarms of robots could also be unleashed to contain an oil spill or to self-assemble into a piece of hardware after being launched separately into space, Correll said. SF fans (as well as fans of supermarionation) remember the early 1980's series The Terrahawks, which had spherical robots called Zeroids that worked together to fight the evil witch-like alien Zelda.